I hate, hate, HATE busy weekends!!! I spend all week running around and I want to have my weekends for me. I want to sleep in for crying out loud! Not the case this weekend. But instead of boring you with the moans and groans, I'll introduce you to our 5th family member. I'll save the moaning and groaning for tomorrow! Blogworld, I'd like you to meet Kitty! And by the way, she was sleeping here. And I mean Knocked Out!!! Too funny- I HAD to take a picture!! So the story behind Kitty is rather interesting. We have lived in this house for close to 8 years. 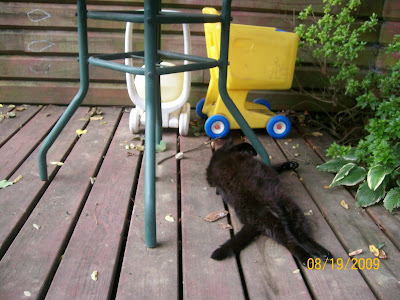 A few years after we moved in we noticed a cat occasionally in the backyard. She seemed nice enough - would let us pet her and scratch behind her ears. Well, I guess Kitty thought we were nice people because she started hanging out on our back porch more and more. My husband, being the softy that he is, thought it was a good idea to feed the cat. Once he did that, you KNOW that this cat was never leaving our porch again! 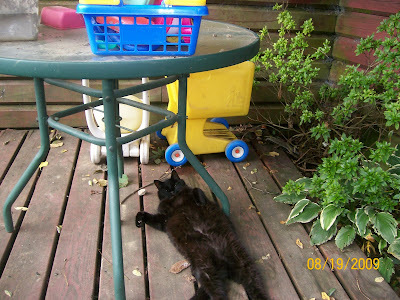 And later on, being the softy that I am, I decided to put a box on the back porch for her to sleep in. Over the years, this box has accumulated numerous blankets. Quite a cozy pad Kitty has!!! Now, I have never been much of a cat person. It's not that I didn't like them, it's that THEY didn't like ME. Growing up, my mom had 2 cats. One was not a people person and we rarely saw her. The other, Princess (who really didn't live up to her name in my opinion) was around quite often. Princess HATED me. If I drew a picture, there she was peeing on it! One day I was walking into the kitchen. Princess jumped on my head!!! I don't care what my family says. I did not get in her way! She didn't like me and jumped on my head! This is also the cat that would attach itself to my mom's legs if she was holding me. Princess was not declawed! Ever since then, I have not had much luck around cats. They either leave me alone or they hate me and love to show their detest for me. Kitty is different. It's to the point that when I go outside, if I sit down, she is on me like white on rice. And if I don't pet her, look out! She'll rub all over my arm and be a pest until I do. And she especially likes to be scratched on the head. Not under her neck. Then she'll bite. Trust me, I know this! And she's good around the kids, too. Well, at least with Paige. If Mike came running out the door screaming at me, I wouldn't want him to pet me either! So there you have it...our Kitty. A nice, happy post about a pretty cool animal. Much better than moaning and groaning. I'm sure I'll have enough of that to do by tomorrow night. Consider that a warning! Go pick up your Kitty kat Bedazzled sweatshirt award on my blog! Five TV shows that I shall watch this season: and no one BEST INTERRUPT MEme. Come join us if you have time! What an adorable kitty! I hope she brings lots of love to your family.